Layered Lemon Curd Sponge Cake by amandazara. A Thermomix <sup>®</sup> recipe in the category Desserts & sweets on www.recipecommunity.com.au, the Thermomix <sup>®</sup> Community. Pre-heat oven to 180˙C, Grease and line 2 round 20cm cake tins with baking paper. Sift the flour 2 times and set aside. Insert butterfly, place eggs and sugar in TM bowl and mix on Speed 4 for 6 minutes, or until mixture is thick, pale and has tripled in volume. Sift flour over egg mixture and gently combine on Speed 1.5 for 20 seconds. To assemble slice the cooled cakes in half. 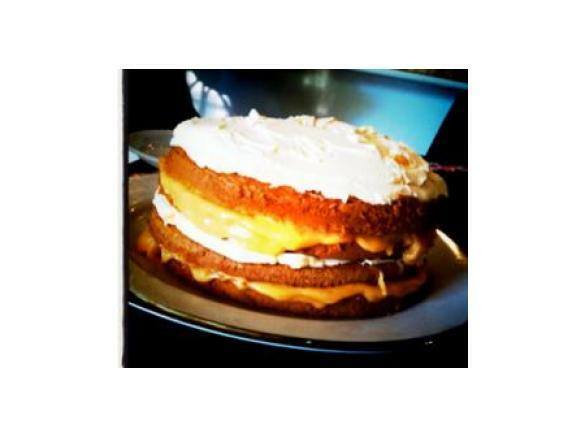 Place one cake layer on serving plate and spread first layer with half the lemon curd. Top with another layer of cake and then spread with half the cream. Repeat with next two layers of cake, lemon curd and cream. Use fresh room temperature eggs so that the batter will increase in volume. Avoid using a skewer to test the sponge as this releases the air necessary to make a light sponge. Use a serrated knife and carefully slice the cake horizontally while pressing down gently on the top. Submitted by Penny83 on 3. April 2018 - 11:31. I followed this recipe exactly and my sponge has turned out eggy. The whole house smells like egg. So disappointing because it looked delicious. Any idea what I may have done wrong? Submitted by Thermomazing - Sarah Foley on 18. February 2011 - 22:19. Submitted by Thermomazing - Sarah Foley on 18. February 2011 - 22:18.